• In 2006, a man was arrested for smashing three 17th century Chinese porcelain vases said to be worth £500,000 (about $789,000) at the Fitzwilliam Museum in Cambridge, England. . . . .
For Harry Chen, a folded paper crane is a hope for many things: freedom, democracy, world peace — and his own good health. Chen, a Taiwanese-Canadian, has recently made a habit of folding small origami paper cranes. He has also spent the last two years living with kidney cancer. “When I was in the hospital, I started to fold those things,” he said, but it’s a skill he’s had for some time. At six years old, his kindergarten teacher first taught him origami to stop his crying. After undergoing surgery, chemotherapy and radiation, Chen’s cancer is now under control. 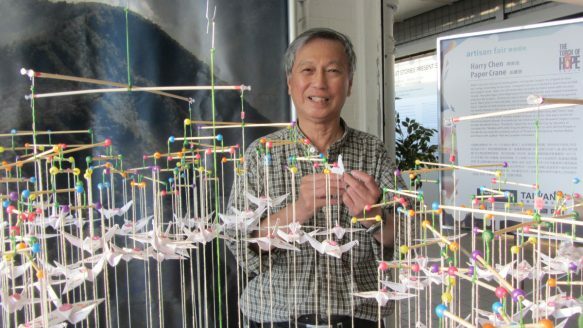 In July 2014, when he was out of the hospital but still recovering, he began folding more cranes in his spare time: on the bus, in the doctor’s waiting room and while out shopping with his wife. He was inspired by the story of Sadako Sasaki, a Japanese girl who famously attempted to fold 1,000 paper cranes in 1955 for good health. Sasaki developed leukemia after she had been exposed to radiation from the Hiroshima atomic bomb as a young child. With Sasaki in mind, Chen kept folding, and just 10 months later, he stopped at 2,345: a representation of Taiwan’s 23.45 million population. Chen is displaying his cranes, attached onto mobiles, at TaiwanFest this weekend at the Harbourfront Centre. On Friday evening, a crowd had already gathered around Chen’s display. Organizers expect up to 50,000 people to pop in between Friday and Sunday for the festivities. In addition to Chen’s mobiles, there are several other art and cultural pieces on display throughout the Harbourfront grounds. The festival is multidisciplinary, incorporating art, music, culture and food. It’s held for two weekends back to back: this weekend in Toronto the next in Vancouver. 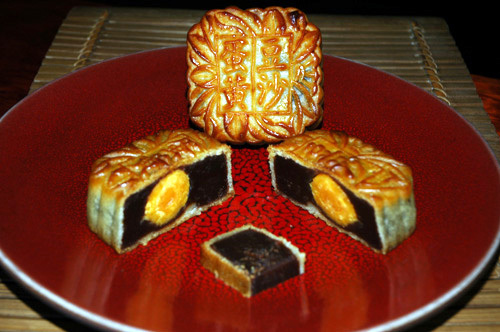 The guests tend to be Taiwanese-Canadians coming from all areas of the city, according to the festival’s managing director Charlie Wu. But the event is also for Torontonians who may not know a lot about Taiwan. Diverse programming is the key to attracting non-Taiwanese Canadians to the festival, he said. For instance, this year, they are hosting a fashion designer whose heritage is of Taiwan’s indigenous peoples, who dwelled on the island for thousands of years before the now-predominant Han Chinese began arriving in numbers in the 17th century. It’s hoped that presence of the designer, known simply as Andre, attracts Torontonians with a general interest in fashion or indigenous peoples’ culture and art. . . . .